What do JA Programs teach? JA programs teach students in kindergarten through high school important real-world concepts in financial literacy, work readiness and entrepreneurship. What is expected of a JA Volunteer? We have opportunities to meet every schedule, from one-time visits that last just 90 minutes, to seven-lesson programs that allow you to build strong rapport with a class. Our staff can also work with you to accommodate your schedule as necessary. Please see a summary of time commitments for some of our most popular programs below. To see specific classes, please click on the Volunteer Opportunities button above. 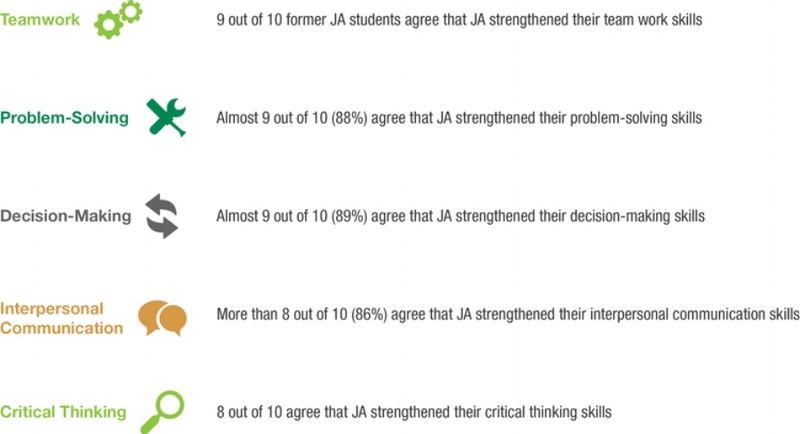 How do JA programs help students succeed?